Description of the 3 mosaic floors that are hanging over the entrance to the passport control hall in Ben-Gurion airport. 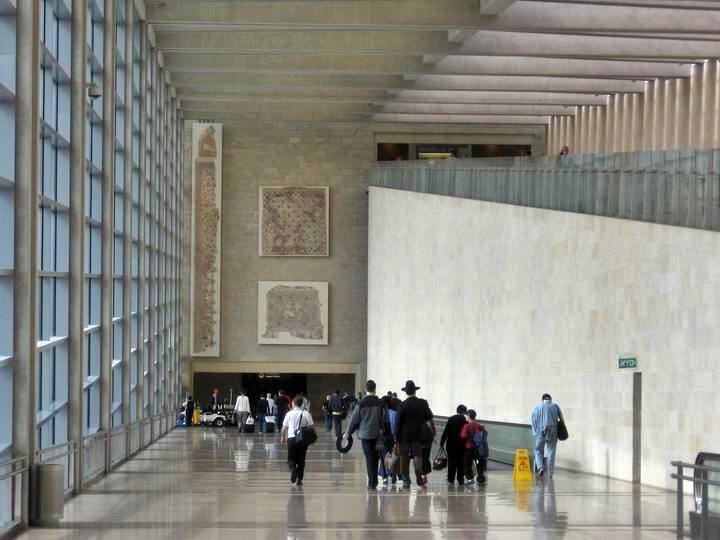 Almost all visitors to Israel enter via the Ben-Gurion airport east to Tel-Aviv. A new terminal was opened there in November 2004. A set of 3 mosaics floors were installed above the tall entrance to the arrivals passport control hall, as seen in the photo below. This web page describes these mosaics. The mosaics below are arranged in the same order that they are displayed in the entrance to the passport control hall. There is a small plate to their right that provides this description. The plate credits the Israeli Antiquities Authority and dedicates it to the memory of its former founder, Maj. General Amir Drori. 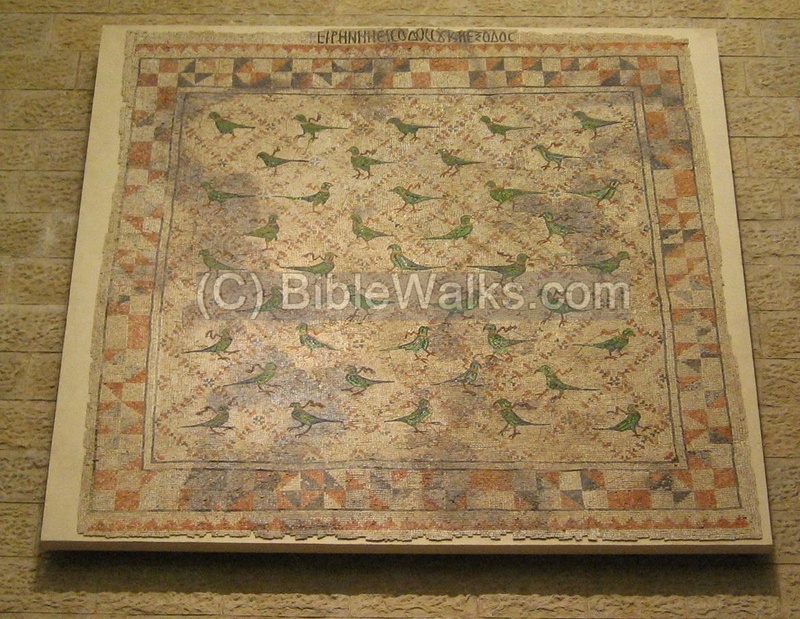 A magnificent mosaic floor was discovered in a Byzantine structure (5th-6th C AD) in BethLehem of the Galilee. It features animals, birds, trees, grapes, and geometric patterns. This mosaic floor is from Beth-Shean and dated to the Byzantine period, 5-6TH C AD. It is decorated with a pattern of birds, each bird has a ribbon tied around its neck. The Greek inscription spells a Biblical text: "Blessed shalt thou be when thou comest in, and blessed shalt thou be when thou goest out." (Deuteronomy 28:6). This text is indeed appropriate for welcoming the visitors to the Holy Land. 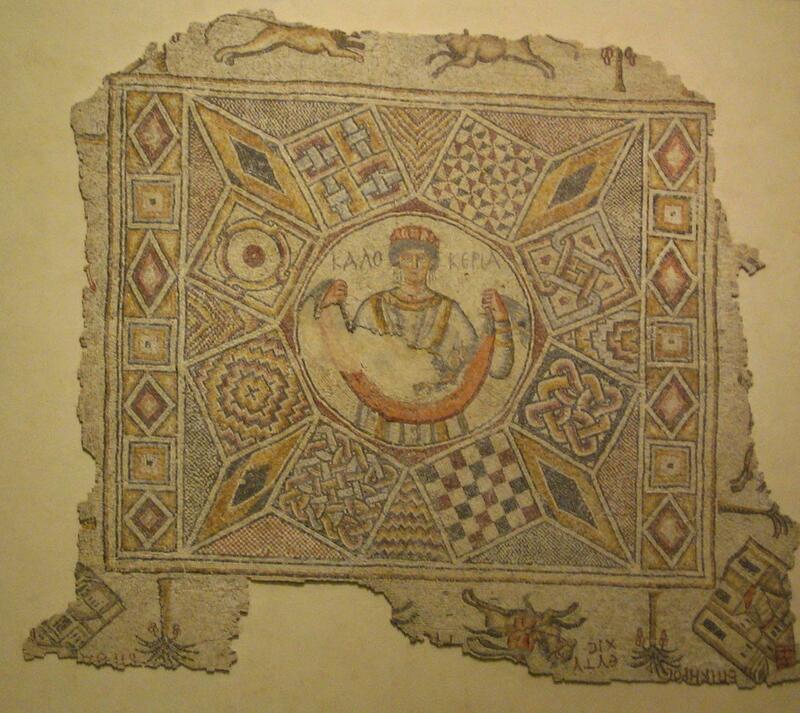 The lower right mosaic on display is from Caesarea Maritama. This 6th C AD mosaic floor is decorated with animals, geometric shapes, animals and trees, and in the center a woman holding a fruit basket. Her Greek name, Kalokeria, is inscribed around the figure and suggests prosperity. This is the spirit of the city: fruitful, large, plentiful, a good city.